Historic Hat Creek is located on one of the few sections of the original Cariboo Wagon Roads still accessible to the public. The ranch includes almost 130 hectares (320 acres) of fields and hills in the sunny southern Interior of B.C. The buildings stand as they did in 1901; some were built as early as 1860. Between1885 and 1905 they witnesses the busiest era of transportation along the Road, serving the needs of freight wagons and passengers of the B.C. Express line (The “BX”). We invite you to explore this era, through the exhibits and special interpretive activities presented by our staff. Open from May 1st to September 30th. Historic Hat Creek offers you a rare opportunity to explore the original buildings used by the Gold Rush travellers of the 1860’s. Stroll along the actual dirt road the wagon trains traveled on, and visit the historic roadhouse, where interpreters dressed in period clothing will take you on a guided tour. 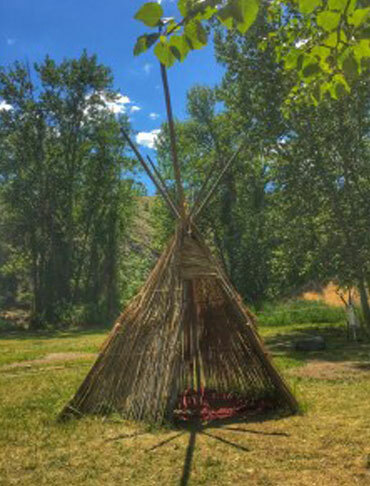 A stagecoach ride along the beautiful Hat Creek will take you to our Native Village, where members of the Shuswap Nation will share their fascinating history and culture. Enjoy lunch in our air-conditioned, licensed restaurant with a scenic outdoor patio, and visit the gift shop which stocks souvenirs and unique items from talented, local crafters. Educational programs are available for school groups and youth groups. As well, we offer the perfect location for weddings and reunions, with cabins and camping galore. Come and experience one of the most distinctive heritage sites in British Columbia! Historic Hat Creek is located at the intersection of Hwy 97 & 99 in Beautiful British Columbia. 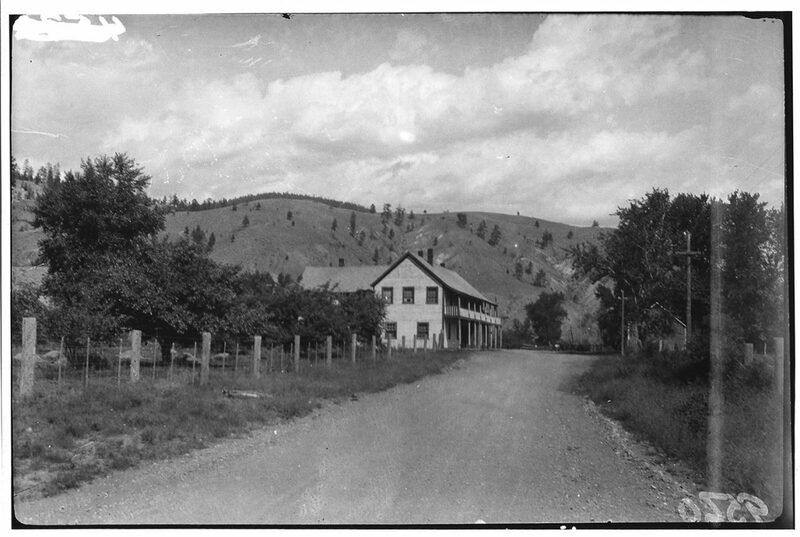 Hat Creek House was established in 1861 by former Hudson’s Bay Company trader Donald McLean. What began as a small log stopping house later became a two-storied structure, and a west wing was added in 1901. It is the last remaining roadhouse of its type and one of the largest ever known along the Cariboo Wagon Road. Our guided tours of the old rooms reveal an intriguing history of the personalities who operated the ranch and traveled through it on the Cariboo Wagon Road. You will see the big ranch kitchen, the saloon and stage passenger waiting room. Victorian era wallpapers and Granny McLean’s sewing machine, brought here around Cape Horn! McLean’s Cabin, originally built in 1863 at the confluence of Hat Creek and the Bonaparte River, was moved to its present site behind the roadhouse in 1901. Hear the fascinating story how three of Donald McLean’s sons and their friend Alex Hare became known as the “Wild McLean’s” and later found a tragic end in New Westminster. Hat Creek Roadhouse was famous for its hearty meals, which were prepared from the ranch’s own produce, grown in a flood-irrigated garden and kept fresh in the recently restored Root Cellar. Chickens, turkeys, pigs and goats were raised in the 1898 Pig Barn and in the sod-roofed Chicken Coop, built in 1872. The Indigenous Interpretation Site is a great place to start your visit! Long before fur traders, Gold Rush miners, ranchers and settlers arrived in this valley, people of the Shuswap Nation followed a nomadic lifestyle here for thousands of years. Local Stuctwesemc (“Stluck-TOW-uhsen”) people from the Bonaparte Reserve have reconstructed traditional shelters, hunting and fishing gear, cook pits, and many other items you would find in a Shuswap Village. You will also have a rare opportunity to see an actual ‘Kekuli’ pit house, built half above and half under ground. Interpreters may be available to show you crafts, tools, and technologies of a self-sufficient culture that has always closely integrated the natural resources of this region into their lifestyle. The Indigenous Interpretation Center has many traditional displays and artifacts that have interpretive signage, Indigenous Site Interpreters may be available to answer questions. The Indigenous Interpretation Center has many traditional displays and artifacts that are explained through our knowledgeable interpreters, or you may visit the site on your own as each display has interpretive signage as well. Pithouse: The traditional winter lodge of the Shuswap First Nations People, built half above ground and half below. The lodge was used from late fall until spring and was built to various sizes, depending on the size of the family that was to occupy it. A typical Kekuli would accommodate between 25-30 people, from grandparents to grandchildren of the immediate family. Bark Lodge: Bark lodges were constructed and used when the men and boys were away from the village over night, sometimes traveling many days while hunting. The lodge was constructed using long pieces of bark that were collected and laid one on top of the other to prevent wind and rain entering these temporary shelters. Sweat Lodge: Many people of the Shuswap used sweat lodges as a place for naturally cleansing body and spirit. Volcanic lava rocks were gathered from the surrounding area and heated to extreme temperature. The lodge was constructed of red and yellow willow branches shaped to form a dome, then covered with fur boughs and deer hides. Summer Lodge: The summer lodge was made from a bamboo-like material called bullrush. Summer lodges were used from early spring to late fall. The bullrushes were peeled, then woven together with sinew. 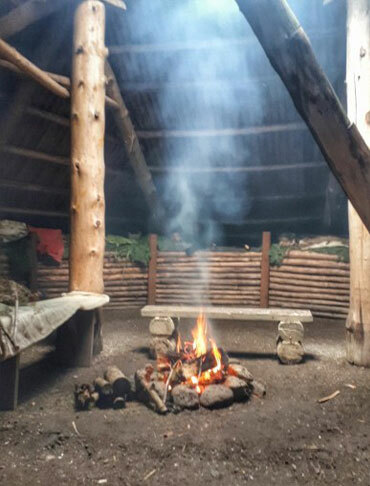 The lodge has a frame similar to a tee pee, but instead of hides, bullrush mats were layered and laid on the frame. The bullrush would shrink in the summer heat to let a cool breeze go through the lodge, but would swell and expand in the rain to form a tight, waterproof cover. Lean-To: The lean-to’s were used at fishing or hunting camp areas. They were constructed to stand anywhere from 10 to 20 feet high and were built at an angle. The lean-to was covered with either fur boughs or bullrush mats. They would accommodate several people but were easy to construct and move. Fish Weir: The fish weir was made of red and yellow willow branches about 4 to 6 feet long, which were woven together with sinew or cottonwood root. Fish weirs were used in shallow waters such as creeks or rivers. The weir would be stretched out across the width of the body of water from one side to the other, and the men would then stand in the water behind the weir and use a spear to pull out the salmon or trout. Drying Racks: Drying racks were used to preserve vegetables, medicines, roots and berries. 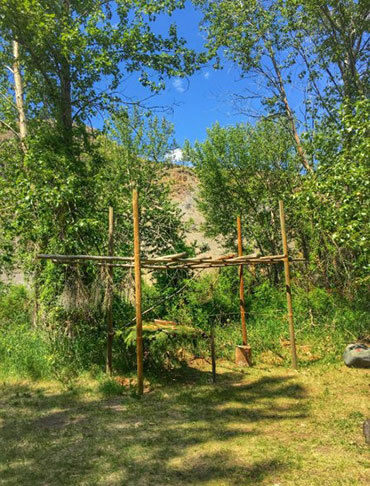 There were two parts to the rack: the top was used for hanging vegetables and medicines to dry naturally in the sun and air (there were over 1,500 remedies that were used by the Shuswap People). Some of the vegetables found in our area are wild onions, celery, potatoes, carrots and parsnip. The bottom rack was used to dry fruits and berries. They would be put on a cattail mat, then another mat was placed over top of the other to protect the berries and fruit from insects or birds. Gaming Area: The most popular game is called Lahal, a gambling game that was and still is played throughout British Columbia amongst Indigenous Peoples. This game brought many different tribes together and involved lots of laughter and singing. The game stakes were very high, at times providing the winners with lavish gifts such as horses, food, canoes, clothing and many other valuable goods.